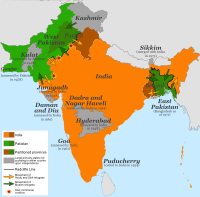 English: The Partition of India (Hindi: हिंदुस्तान का बटवारा, Devanagari: Hindustān ka Batwārā, Hindustani: ہندوستان کی تقسیم (Nastaleeq) Hindustān ki Taqseem) was the partition of British India on the basis of religious demographics that led to the creation on 15 August 1947 of the sovereign states of the Dominion of Pakistan (later the Islamic Republic of Pakistan and the People's Republic of Bangladesh) and the Union of India (later Republic of India), promulgated in the Indian Independence Act 1947 and resulted in the dissolution of the British Indian Empire. The struggle between the new dominions of India and Pakistan which resulted from the partition displaced up to 12.5 million people in the former British Indian Empire, with estimates of loss of life varying from several hundred thousand to a million. [The violent nature of the partition created an atmosphere of mutual hostility and suspicion between India and Pakistan that plagues their relationship to this day. The partition of India included the geographical division of the Bengal province of British India into East Bengal, which became part of the Dominion of Pakistan (from 1956, East Pakistan, until independence as Bangladesh in 1971) and West Bengal, which became part of India; and the similar partition of the Punjab province into West Punjab (later the Pakistani Punjab and Islamabad Capital Territory) and East Punjab (later the Indian Punjab, Haryana and Himachal Pradesh). The partition deal also included the division of Indian government assets, including the Indian Civil Service, the Indian Army, the Royal Indian Navy, the Indian railways and the central treasury, and other administrative services. In the aftermath of Partition, the princely states of India were all incorporated into one or other of the new dominions, in almost all cases by the ruler signing as instrument of accession. The question of the choice to be made in this connection by Jammu and Kashmir led to the Indo-Pakistani War of 1947 and other wars and conflicts between India and Pakistan. Pages in category "Partition of India"
Media in category "Partition of India"